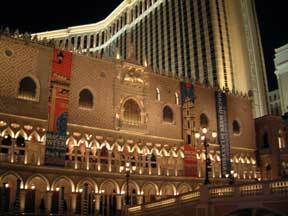 This hotel and casino takes inspiration from old Venice, with real opera-singing gondaliers operating on canals both inside and outside the building. (the outside gondolas are just a tad more inexpensive). The massive shopping section is built to look like an Italian plaza, complete with clouds painted on the ceilings. Most days there are people posed as living statues throughout the marketplace. There is a branch of the Guggenheim museum here as well, with regularly rotating art exhibits.